Feet: edema; Legs: hemorrhages; Hock: subcutaneous edema. This image was taken 4 days post experimental inoculation with highly pathogenic avian influenza. 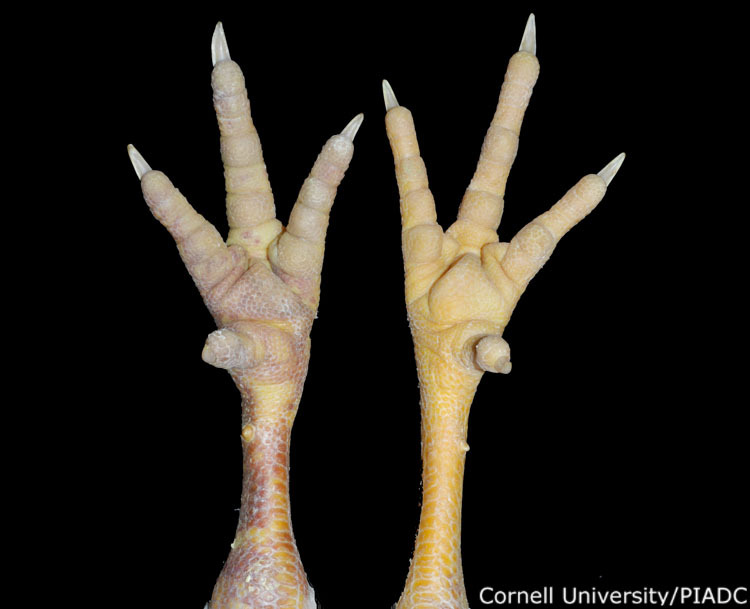 A comparison of 2 birds with HPAI showing the different degree of edema and hemorrhages on the shanks and feet. These two legs are from two different birds. The right leg leg shows minimal swelling of the foot. In the left leg, there is more extensive hemorrhage over the intertarsal joint, the skin overlying the tarsometatarsus, digital and metatarsal pad. The photograph was taken 4 days post inoculation. The bird was experimentally inoculated with highly pathogenic avian influenza virus on 3/2/08 at Plum Island Animal Disease Center. The inoculation was performed in the caudal thoracic air sac with strain A/CK/PA/469/3-84/H5N2, using 0.25ml.